Provides the Page request event handler class. The Page class plays a central role in Click applications defining how the application's pages are processed and rendered. All application pages must extend the base Page class, and provide a no arguments constructor. no-args constructor invoked to create a new Page instance. At this point no dependencies have been injected into the Page, and any request information is not available. You should put any "static" page initialization code, which doesn't depend upon request information, in the constructor. This will enable subclasses to have this code automatically initialized when they are created. onSecurityCheck() method called to check whether the page should be processed. This method should return true if the Page should continue to be processed, or false otherwise. onInit() method called to complete the initialization of the page after all the dependencies have been set. This is where you should put any "dynamic" page initialization code which depends upon the request or any other dependencies. Form and field controls must be fully initialized by the time this method has completed. 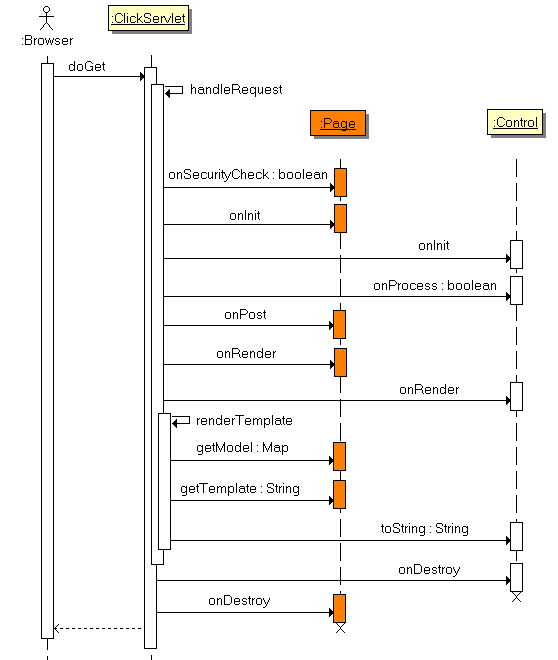 ClickServlet processes all the page controls calling their Control.onProcess() method. If any of these controls return false, continued control and page processing will be aborted. onGet() method called for any additional GET related processing. Form and field controls should NOT be created or initialized at this point as the control processing stage has already been completed. onRender() method called for any pre-render processing. This method is often use to perform database queries to load information for rendering tables. ClickServlet renders the page merging the model with the Velocity template defined by the getTemplate() property. onDestroy() method called to clean up any resources. This method is guaranteed to be called, even if an exception occurs. You can use this method to close resources like database connections or Hibernate sessions. getTemplate() to find the Velocity template. These Page properties are also used when rendering JSP pages. The list of page controls. The Velocity template formatter object. Indicates whether Control head elements should be included in the page template, default value is true. The map of localized page resource messages. The Page action request parameter: "pageAction". The global page messages bundle name: click-page. The path of the page template to render. The path of the page border template to render. Add the control to the page. Add the named object value to the Pages model map. Return the HTTP response content type. Return the request context of the page. Return the list of page Controls. Return the Velocity template formatter object. Return the path to forward the request to. Return the list of HEAD elements to be included in the page. Return the map of HTTP header to be set in the HttpServletResponse. Return the localized Page resource message for the given resource name or null if not found. Return the formatted page message for the given resource name and message format arguments or null if no message was found. Return a Map of localized messages for the Page. Return the Page's model map. Return the path of the Template or JSP to render. Return the path to redirect the request to. Return the path of the page border template to render, by default this method returns getPath(). Return true if the page has any controls defined. Return true if the page has headers, false otherwise. Return true if the Control head elements should be included in the page template, false otherwise. The on Destroy request event handler. The on Get request event handler. The on Initialization event handler. The on Post request event handler. The on render event handler. The on Security Check event handler. Remove the control from the page. Set the Velocity template formatter object. Set the request to forward to the given page class. The Page instance to forward the request to. Set the path to forward the request to. Set the named header with the given value. Set the map of HTTP header to be set in the HttpServletResponse. Set whether the Control head elements should be included in the page template. Set the path of the Template or JSP to render. Set the request to redirect to the give page class. Set the request to redirect to the given page class and and append the map of request parameters to the page URL. Set the location to redirect the request to. Set the request to redirect to the given location and append the map of request parameters to the location URL. Set the page border template path. The page model. For Velocity templates the model is used to populate the Velocity context. For JSP pages the model values are set as named request attributes. The page is stateful and should be saved to the users HttpSession between requests, default value is false. The on Security Check event handler. This event handler is invoked after the pages constructor has been called and all the page properties have been set. Security check provides the Page an opportunity to check the users security credentials before processing the Page. If security check returns true the Page is processed as normal. If the method returns then no other event handlers are invoked (except onDestroy() and no page controls are processed. If the method returns false, the forward or redirect property should be set to send the request to another Page. By default this method returns true, subclass may override this method to provide their security authorization/authentication mechanism. The on Initialization event handler. This event handler is invoked after the onInit() method has been called. Subclasses should place any initialization code which has dependencies on the context or other properties in this method. Generally light weight initialization code should be placed in the Pages constructor. Time consuming operations such as fetching the results of a database query should not be placed in this method. These operations should be performed in the onRender(), onGet() or onPost() methods so that other event handlers may take alternative execution paths without performing these expensive operations. Please Note however the qualifier for the previous statement is that all form and field controls must be fully initialized before they are processed, which is after the onInit() method has completed. After this point their onProcess() methods will be invoked by the ClickServlet. Select controls in particular must have their option list values populated before the form is processed otherwise field validations cannot be performed. For initializing page controls the best practice is to place all the control creation code in the pages constructor, and only place any initialization code in the onInit() method which has an external dependency to the context or some other object. By following this practice it is easy to see what code is "design time" initialization code and what is "runtime initialization code". The on Get request event handler. This event handler is invoked if the HTTP request method is "GET". The event handler is invoked after onSecurityCheck() has been called and all the Page controls have been processed. If either the security check or one of the controls cancels continued event processing the onGet() method will not be invoked. Form and field controls should NOT be created or initialized at this point as the control processing stage has already been completed. Select option list values should also be populated before the control processing stage is performed so that they can validate the submitted values. The on Post request event handler. This event handler is invoked if the HTTP request method is "POST". The event handler is invoked after onSecurityCheck() has been called and all the Page controls have been processed. If either the security check or one of the controls cancels continued event processing the onPost() method will not be invoked. The on render event handler. This event handler is invoked prior to the page being rendered. This method will not be invoked if either the security check or one of the controls cancels continued event processing. The on render method is typically used to populate tables performing some database intensive operation. By putting the intensive operations in the on render method they will not be performed if the user navigates away to a different page. If you have code which you are using in both the onGet() and onPost() methods, use the onRender() method instead. The on Destroy request event handler. Subclasses may override this method to add any resource clean up code. This method is guaranteed to be called before the Page object reference goes out of scope and is available for garbage collection. Add the control to the page. The control will be added to the page model using the control name as the key. The Controls parent property will also be set to the page instance. Please note: if the page contains a control with the same name as the given control, that control will be replaced by the given control. If a control has no name defined it cannot be replaced. Remove the control from the page. The control will be removed from the pages model and the control parent property will be set to null. Return the HTTP response content type. By default this method returns "text/html". If the request specifies a character encoding via If ServletRequest.getCharacterEncoding() then this method will return "text/html; charset=encoding". The ClickServlet uses the pages content type for setting the HttpServletResponse content type. The ClickServlet adds the format object to the Velocity context using the key "format" so that it can be used in the page template. value - the Velocity template formatter object. If the forward property is not null it will be used to forward the request to in preference to rendering the template defined by the path property. The request is forwarded using the RequestDispatcher. If the forward property is not null it will be used to forward the request to in preference to rendering the template defined by the path property. The request is forwarded using the Servlet RequestDispatcher. If forward paths start with a "/" character the forward path is relative to web applications root context, otherwise the path is relative to the requests current location. To forward to the customer search.htm page from the web app root you could set forward as setForward("/customer/search.htm") or setForward("customer/search.htm"). If a user was currently viewing the add-customer.htm to forward to customer details.htm you could set forward as setForward("/customer/details.htm") or setForward("../details.htm"). The Page instance to forward the request to. The given Page object must have a valid path defined, as the path specifies the location to forward to. page - the Page object to forward the request to. Set the named header with the given value. Value can be either a String, Date or Integer. Return the list of HEAD elements to be included in the page. Example HEAD elements include JsImport, JsScript, CssImport and CssStyle. Pages can contribute their own list of HEAD elements by overriding this method. // first time this method is called. One can also add HEAD elements from event handler methods such as onInit(), onGet(), onPost(), onRender() etc. The order in which JS and CSS files are included will be preserved in the page. Note: this method must never return null. If no HEAD elements are available this method must return an empty List. Also note: a common problem when overriding getHeadElements in subclasses is forgetting to call super.getHeadElements. Consider carefully whether you should call super.getHeadElements or not. Return the localized Page resource message for the given resource name or null if not found. The resource message returned will use the Locale obtained from the Context. To define global page messages simply add click-page.properties file to your application's class path. Message defined in this properties file will be available to all of your application pages. Note messages in your page class properties file will override any messages in the global click-page.properties file. Please see the MessagesMap adaptor for more details. Return the formatted page message for the given resource name and message format arguments or null if no message was found. The resource message returned will use the Locale obtained from the Context. getMessage(java.lang.String) is invoked to retrieve the message for the specified name. Return a Map of localized messages for the Page. The messages returned will use the Locale obtained from the Context. Please note: if the Page contains an object with a matching name, that object will be replaced by the given value. Return the Page's model map. The model is used populate the Velocity Context with is merged with the page template before rendering. Return the Page header imports. If you need to tailor the page imports rendered, override this method and modify the PageImports object returned. Set the Page header imports. If you need to tailor the page imports rendered, override the getPageImports() method and modify the PageImports object returned. If this method returns null, Click will not perform any rendering. This is useful when you want to stream or write directly to the HttpServletResponse. By default Click will set the path to the requested page url. Meaning if the url /edit-customer.htm is requested, path will be set to /edit-customer.htm. And here is an example if you want to change the path to a different JSP. If path is set to null, Click will not perform any rendering. This is useful when you want to stream or write directly to the HttpServletResponse. If the redirect property is not null it will be used to redirect the request in preference to forward or path properties. The request is redirected to using the HttpServletResponse.setRedirect() method. Return true if the page is stateful and should be saved in the users HttpSession between requests, default value is false. Set whether the page is stateful and should be saved in the users HttpSession between requests. Click will synchronize on the page instance. This ensures that if multiple requests arrive from the same user for the page, only one request can access the page at a time. Stateful pages are stored in the HttpSession using the key page.getClass().getName(). It is worth noting that Click checks a Page's stateful property after each request. Thus it becomes possible to enable a stateful Page for a number of requests and then setting it to false again at which point Click will remove the Page from the HttpSession, freeing up memory for the server. Return true if the Control head elements should be included in the page template, false otherwise. Default value is true. By setting this value to false, Click won't include Control's head elements, however the Page head elements will still be included. If the redirect property is not null it will be used to redirect the request in preference to the forward and path properties. The request is redirected using the HttpServletResponse.setRedirect() method. If the redirect location begins with a "/" character the redirect location will be prefixed with the web applications context path. Note if the given location is already prefixed with the context path, Click won't add it a second time. For example if an application is deployed to the context "mycorp" calling setRedirect("/customer/details.htm") will redirect the request to: "/mycorp/customer/details.htm"
If the redirect location does not begin with a "/" character the redirect location will be used as specified. Thus if the location is http://somehost.com/myapp/customer.jsp, Click will redirect to that location. JSP note: when redirecting to a JSP template keep in mind that the JSP template won't be processed by Click, as ClickServlet is mapped to *.htm. Instead JSP templates are processed by the Servlet container JSP engine. So if you have a situation where a Page Class (Customer.class) is mapped to the JSP ("/customer.jsp") and you want to redirect to Customer.class, you could either redirect to ("/customer.htm") or use the alternative redirect utility setRedirect(java.lang.Class). Please note that Click will url encode the location by invoking response.encodeRedirectURL(location) before redirecting. The map keys will be used as the request parameter names and the map values will be used as the request parameter values. Pages can override this method to return an alternative border page template. This is very useful when implementing an standardized look and feel for a web site. The example below provides a BorderedPage base Page which other site templated Pages should extend. Other pages insert their content into this template, via their path property using the Velocity #parse directive. Note the $path value is automatically added to the VelocityContext by the ClickServlet. Note: if this value is not set, getTemplate() will default to getPath().